For many people, Iran might mean the Evil Axis, a nuclear danger and Islamic fundamentalism. However, a big multiethnic society of 80 million inhabitants is much more than that. Film director Majid Majidi, in his 1999 prize-awarded The color of paradise, shows a traditional countryside community far from the geostrategic fight for natural resources and regional power. Mohammad is a blind boy of around 10 years old who, during school vacation, must leave his special-education school in Teheran to spend time with his family. The father, a hard-working widower desperate to start a new family, is confronted with the circumstance of having to choose between his son and a prospective new wife, and be ready for redemption. The universal theme of a parent abandoning a child to start a new family, so common in the Japanese cinema (Nobody knows, Kikujiro’s summer) also arrives at the Iranian film scene. Northern Iranian green mountains and customs are depicted poetically by Majidi, who creates the character of an imaginative and sensitive child with the ability of perceiving reality with his ears and his fingertips at deeper layers than “normal” people, a door to the sacred. 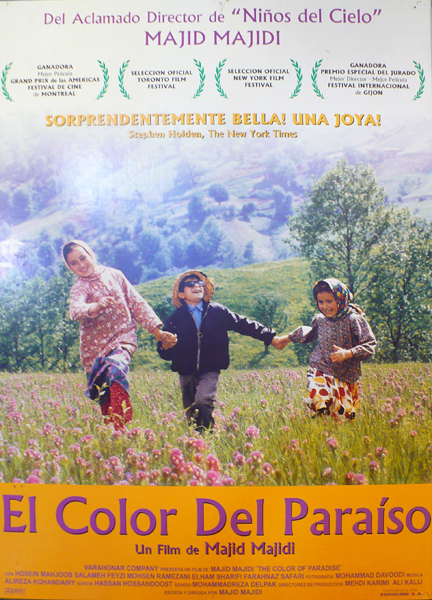 At the end of the showing, Madrid’s Centro Persépolis’s manager repeats for us the film director’s words: “To see things clearly, we need to close our eyes”. Maybe that’s what we have to do to get a proper perspective of politics, love, friendship, work and family.